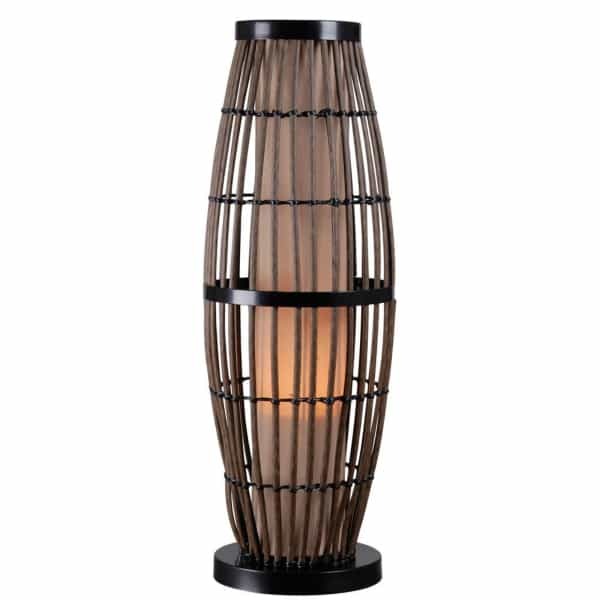 The 31’’ Biscayne Outdoor Table Lamp features the Biscayne signature look. A glowing inner pillar that is canonical radiates light. A rattan cage surrounds the pillar, creating a dressed up beach style with classic cream and wicker interplay being highlighted by the inside light source. The Biscayne Outdoor Table Lamp sits atop an outdoor surface to provide up close lighting for ambient dinners and outdoor reading. The lamp is dressed head-to-toe with safety features that allow the lighting solution to be placed outdoors, rain or shine. The Biscayne Outdoor Table Lamp is UL listed wet locations, it features only weatherproof fabrics, all materials are rustproof, the light bulbs are protected with watertight bulb shields, light switches are UL listed as waterproof, and the base is heavily weighted for stability in winds and storms. Let Kenroy and Family Leisure work together to dress your home indoors and out! We offer free shipping on all orders over $40 in the contiguous United States. Orders under $40 will incur a flat $5.99 Shipping Fee. Most game room accessories ship via UPS / Fed Ex. Most delivery times within the Continental U.S range from 2-5 days depending on location.